The New Beekeepers theory sessions are over, now it is ‘hands-on’ at the Association Apiary. The Apiary reopened for business on Sunday 7 April. We meet every Sunday at 2pm unless a cancellation is posted before noon on the Sunday in question, here on the website. We provide suits, gloves, tools. You have to arrive with boots suitable for dipping in strong disinfectant. 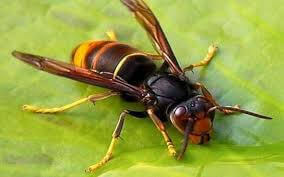 This is an Asian Hornet. It is smaller than our native European hornet. It is mainly black with a yellow band towards the end of its abdomen, and most importantly yellow legs. It is a threat to honey bee hives, and probably bumblebees and other pollinators, and it should not be here. A BeeBase video of the construction of a simple Asian hornet trap can be found on https://www.youtube.com/watch?v=CR6MUekAjMo Strangely the BeeBase website only shows the more complicated version 1. 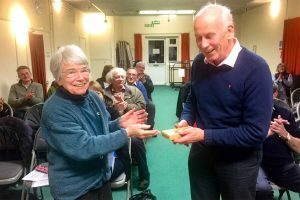 We took great pleasure in awarding our new Unsung Hero award to Greg for his sterling work as our Swarm Collection co-ordinator, among other important things. So next time you get a call to collect a swarm of bees, remember to thank Greg (oh, and get your name down ready for the season to come). Petersfield member and artist Guy Basgshaw, before moving himself and his bees to France, offered PDBKA a trophy to be awarded to a person or persons who have consistently contributed towards the craft of beekeeping and or the support of beekeepers in PDBKA; always in a manner very much out of the limelight. 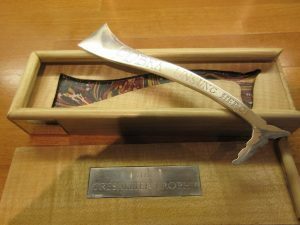 “The hallmarked sterling silver hive tool was modelled in Privett and cast in Basingstoke. It is of an individual design – to sit easily in the hand, facilitate the separation of hive lifts and then both easing out and spacing individual frames. The next apiary meeting will be Sunday 28th April at 2pm. There will be no apiary meeting on Easter Sunday 21st April.